Alzheimer’s disease is the sixth-leading cause of death in the United States today. It’s time to reclaim the future – a future free from this disease. I’m participating in the Alzheimer’s Association Walk to End Alzheimer’s TM, the nation’s largest event to raise awareness and funds to fight Alzheimer’s disease. By joining my team, you can help end this epidemic and show your support for the more than 5 million Americans living with the disease. In my business I see clients and their families affected by this devastating illness. My goal is to raise awareness in the community so we can band together and join forces in fighting Alzheimer’s disease. Beautiful Three Oaks is a scenic recreation area in Crystal Lakes. 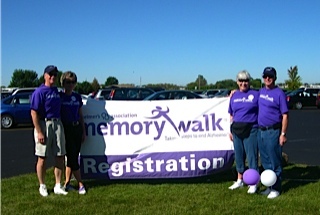 Bring the family and join us as we walk to end Alzheimer’s. The Alzheimer’s Association is the world’s largest voluntary health organization in Alzheimer’s care, support and research, and the funds we raise will go directly toward supporting their efforts.The end of Alzheimer’s starts with you. To register, visit the link below. For more information about this event please contact: Jennifer Ratkovic, Manager, Special Events 815.484.1300 jratkovic at alz.org or download the paper registration forms.